Sweat it out now! But like… what if you don’t? Or like, what if you’re the person who is just sopping wet just after you run down the street after the UPS person? 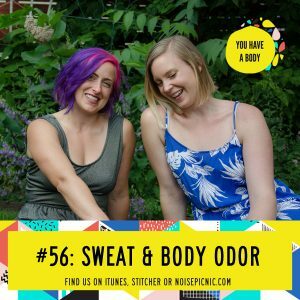 What does sweat do, why is it important, and just what the heck is going on if you’ve got some B.O like nobody’s business? Join Lucia and Hannah this week and they’ll give you all the salty glory RE: SWEAT. Enjoy what you’re hearing? Great! Leave us a review in iTunes and we’ll send a personal shout out on an upcoming episode to you!